Pentacon Six automatic extension tubes. The pin that operates the lens diaphragm can be seen inside the tubes. Close-up (or extension) tubes made by Pentacon, Exakta and Arsenal are available. These tubes are placed between the lens and the camera, thus enabling the user to focus closer to the subject. Note that when an extension tube is used behind the lens, the focussing distances engraved on the lens are no longer accurate, so focus must be carried out by looking at the ground-glass focussing screen of the camera. For all photography closer than the normal minimum focussing distance of the lens, the use of a suitable focussing magnifier is recommended, to avoid mis-focussing by the photographer. You can see these magnifiers here and here. 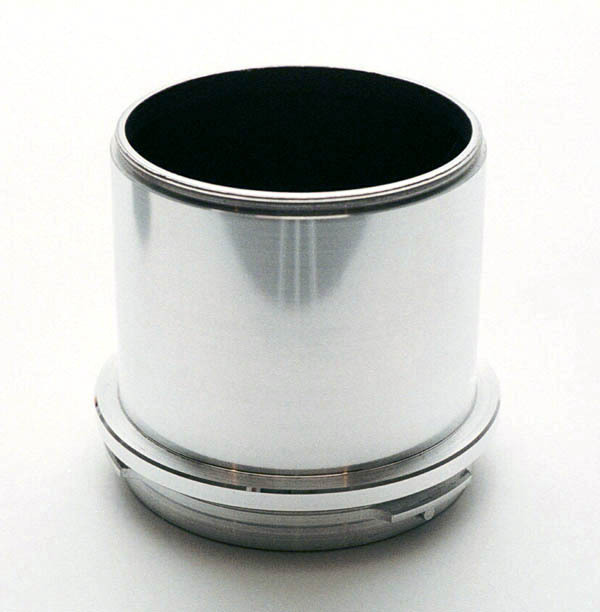 This manufacturer made two types of extension tubes over many years: Manual tubes and automatic tubes. Obviously, all tubes have to be matt black inside to avoid reflections, which would ruin contrast and probably also cause "ghost" images. To see information on the dimensions of these tubes and charts showing the image area covered, image scale, etc., click here. Diaphragm automation may be obtained by adding the special Pentacon aperture control ring with a double cable release – see the pages on the Pentacon Six bellows. This ring is also illustrated lower down on this page. 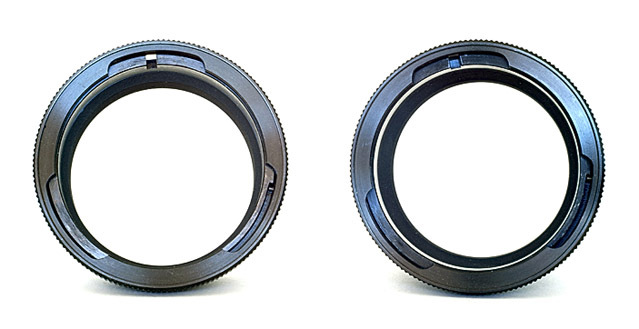 Pentacon’s standard automatic extension tubes come as a set of four. In the image at the top of this page it should be possible to see the aperture control pin. Using any one of the tubes, along with the focussing range of the lens, or any combination of them, provides an enormous range of magnification, and Pentacon published lists of the image area covered by each tube or combination of tubes, and the exposure factors necessary to correct for a meter reading taken without the tubes. Using a TTL meter avoids the need to use these correction factors, and is the approach I always use. As regards the extermal colour of the tubes, in the case of the automatic Pentacon tubes, the availability is the inverse of the case with the manual tubes, i.e., most automatic tubes seen have an external black finish, but some early automatic tubes with an external chrome finish are occasionally seen. I have labelled the black tubes with Dymo tape to show the extension that each one gives. To see the charts showing the image area covered, image scale, etc., click here and scroll down. 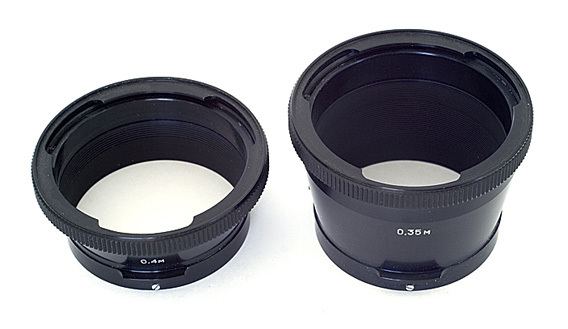 Pentacon realised that there was a gap in the range between using the standard Biometar 80mm lens on its own at maximum extension, and using the same lens at minimum extension (i.e., infinity focus) with the shortest tube in the set. They therefore made a further auto tube to cover that gap. This tube gives an extension of 10mm, and it is so shallow that there is no space for the standard breech-lock ring; instead, the tube is mounted first on the lens, by twisting it into place, and the lens/tube combination is then mounted on the camera body in the standard way. You can see the effect of using the four standard automatic tubes here. You can see the effect of using the 10mm tube here. It will be obvious from the above images that the manual tubes are shorter than the auto tubes. 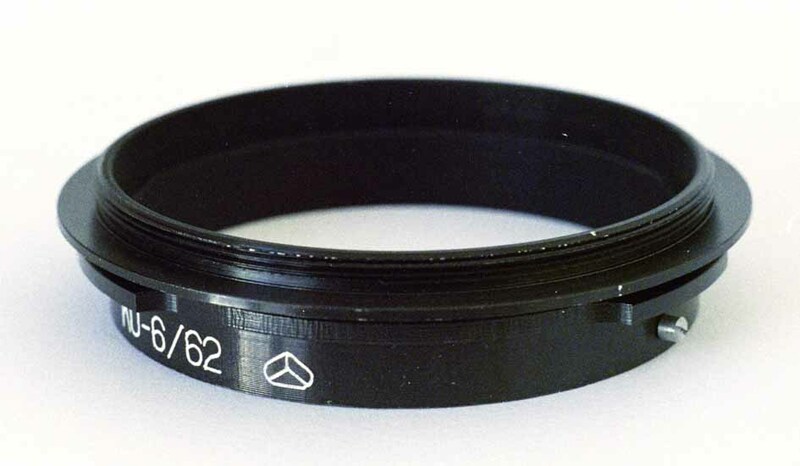 It may be that Pentacon expected photographers to add the special aperture control ring to the front of the manual tubes, in order to maintain auto aperture stop down, via the use of a double cable release. At the same time, they would benefit from the additional extension that the use of this tube provided. 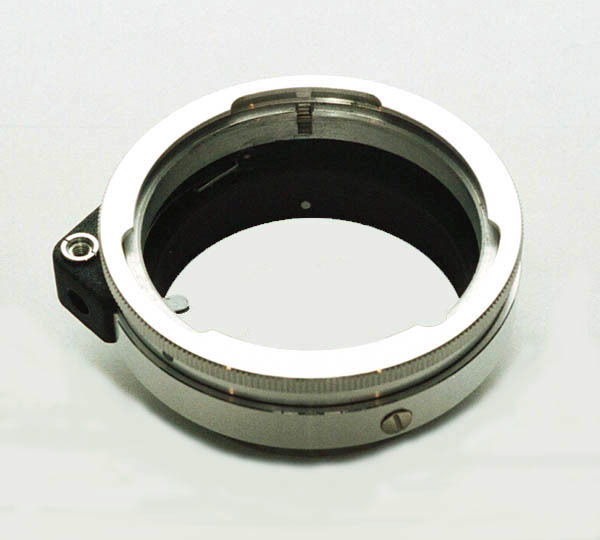 The Pentacon Six aperture control ring is described in detail in the section on the Pentacon Six bellows. A two-tube set made by Arsenal is available. A few years ago these were supplied as a standard accessory with the Kiev 60, but now they are not usually included in the camera kit, and have to be purchased separately. While being entirely adequate for the task, their design is not up to the standard of the Pentacon tubes, and the maximum degree of extension available is much shorter. the minimum focussing distance when used individually with the standard Arsenal lens. The tubes can of course be used together. 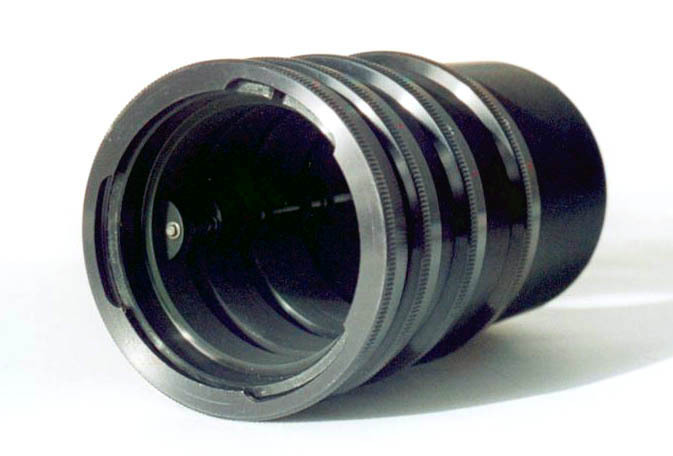 As with the Pentacon manual tubes, diaphragm automation may be obtained by adding the special Pentacon aperture control ring with a double cable release. The automatic tubes do have the aperture-transmission pin, just visible in the next picture. In other respects, they are identical to the manual tubes. Manufacturing tolerances again come into play, and when I mount the Arsenal tubes on my Pentacon Six it is not possible to rotate the locking ring on the camera body by far enough for me to feel confident that the combination will not come apart (!). They work fine on the Kiev 60. For the use of close-up tubes on the Kiev 88-6 body, follow this link. A protruding “pin” on each tube (see image left), to depress a contact on the Exakta 66 TTL meter and set it for stop-down metering. 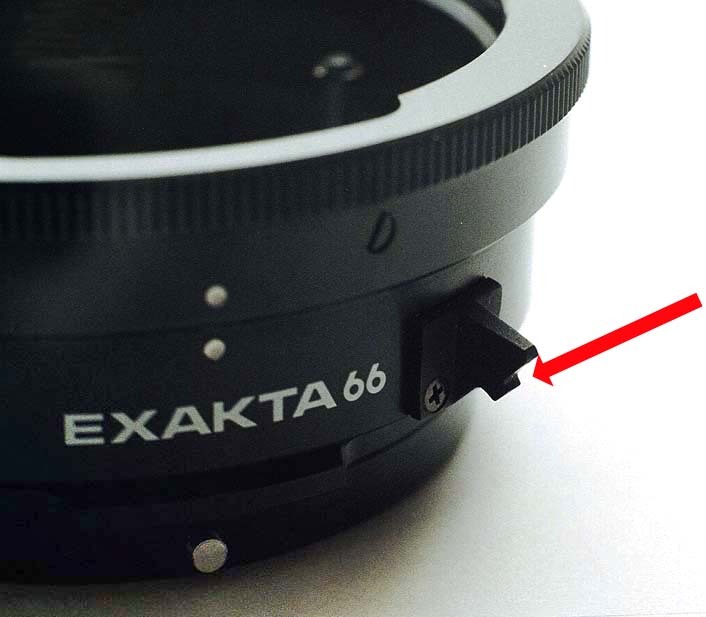 For a description of stop-down metering with the Exakta 66 TTL prism, click here. I need to investigate further the operation of stop-down metering on the Exakta 66, and plan to report on this website when I know the answers. Lenses are designed for optimum performance within a certain focussing range. 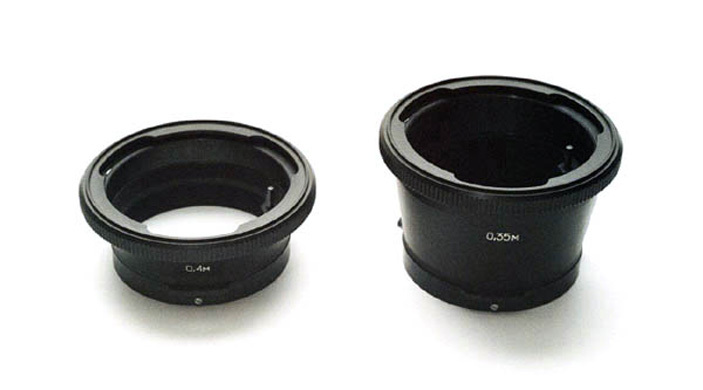 Generally, this range extends from infinity to the closest point achieved with the focussing ring of the lens – although it is well known for zoom lenses, in particular, to exhibit optical faults at certain focal lengths. Fortunately, this is not a problem with the Carl Zeiss Jena and Pentacon lenses. However, beyond the closest focussing distance, greater definition may be achieved by reversing the lens – after all, the rear of the lens operates best over a range of a few inches (from the focal point of the lens to the film plane). Pentacon manufactured a reversing tube. At one end this has a standard lens mount, so that it can be inserted into the front of the bellows, the front of an extension tube, or even directly into the body – although this gives very little control over the degree of magnification available. The other end of the tube has a 58mm diameter thread, which screws straight into the front of the standard 80mm f/2.8 Biometar lens. Obviously, with adapter rings, other lenses could be used if required. You can see this tube in use here and the effect of using it here. Arsenal also make a reversing ring for use with their system. As can be seen from the illustration, it is a very slim affair, with the Pentacon Six bayonet lens mount at one end, and a screw thread to take their standard 80mm Volna lens at the other. This has a 62mm thread. Incidentally, the Arsenal logo is clearly visible on this accessory. The further the lens is moved from the film plane, the more it magnifies the subject being photographed and the dimmer the image that reaches the film. To be able to visualise this, you can try turning on a torch (British English! US English: a flashlight) in a dark room. If you hold the torch near a wall, you will get a high level of illumination, but it will only cover a small area. As you back away from the wall, the cone of light from the torch will spread out and progressively illuminate more of the wall, but the light intensity falling on any particular part of the wall will be less. The total amount of light has not decreased, but it is spread over a wider area. It is often to helpful to imagine light as being rather like the water coming out of a garden hose (a flexible rubber or plastic pipe). Many hoses have an adjustable nozzle at the end. At one setting, it sends all of the water in a powerful jet to one small area, which will soon become soaked. Changing the setting of the nozzle to the other extreme, it sprays exactly the same amount of water over a much wider area, so any one part of the garden will receive less water – even though the same total amount of water is coming out of the nozzle. In fact, there is a light loss within every lens: the closer that we focus, the slightly larger the image on the film becomes, and as it gets larger, it gets less bright at any point in the image, as the existing brightness is spread over a wider area. However, the difference in the intensity of the light reaching the film is so small that this can usually be ignored. In the 1960s and early 1970s, the Carl Zeiss Jena 180mm and 300mm Sonnar lenses compensated for this light loss by opening up the lens aperture automatically by up to a maximum of half a stop as one focussed closer. Increasing numbers of photographers were using the metering prism, which made this correction unnecessary. Even more importantly, the lattitude of colour film had improved greatly, so that such a small amount of correction was not necessary. Furthermore, for photographers shooting at maximum aperture, obviously no aperture compensation was possible. However, in macro photography, the extra extension added by using tubes is frequently so great that some compensation will be necessary. Otherwise, the image on the film will be under-exposed. I reproduce in detail here the information given by Pentacon to enable users to calculate how much more exposure must be given with each tube or combination of tubes, and on the same page I also give a more detailed explanation, also as regards calculating exposure compensation with lenses other than the standard 80mm Biometar or Tessar lens. The section on the Pentacon Six bellows explains how increased definition may be obtainable when mounting the lens in reverse, via the reversing tube. The rear element of the lens is then unprotected from stray light that might degrade the image, or objects that might damage the lens. An excellent lens shade for the rear of the lens can be provided by an extension tube of suitable length. As the special aperture control ring is quite shallow, consider adding a further tube if necessary to shade the lens (checking carefully that no image cut-off is caused!). use a tube with a longer lens to reduce the minimum focussing distance. Thus, a short tube can be used with the 150mm Kaleinar to get closer for portraits – but of course the lens will not focus to infinity while the tube is in place. A reference to this accessory may seem out of place here, but remember that a 2× converter does not affect the minimum focussing distance of the lens with which it is used. * It therefore enables you to take closer-up pictures. You can of course combine a 2× converter with other close-up accessories, as in this shot taken in my garden one summer. 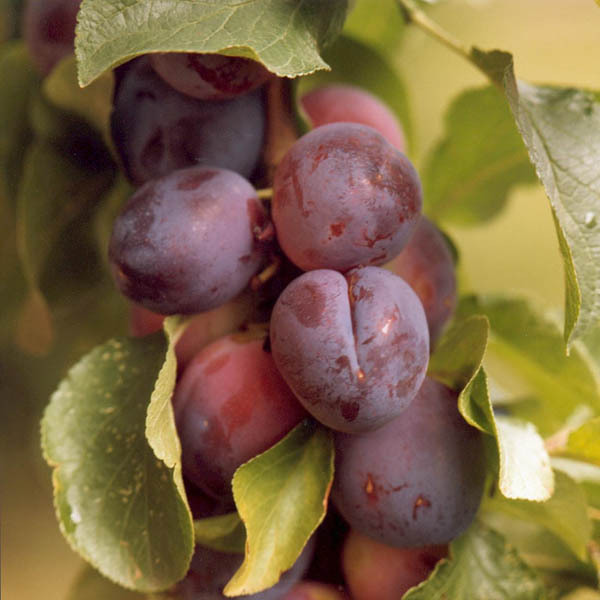 It reminds us that close up doesn’t just mean microscopic; without the 2× converter and an extension tube, I just couldn’t get close enough to these plums. [C300-2: Kiev 60 with Carl Zeiss Jena 80mm Biometar “II”, Arsenal 2× converter and Pentacon No 3 tube. * I am indebted to Bob for improving on my wording here. He points out that "The closest focus to the end of the lens (the working distance) is unaffected by a converter." However, he goes on to say, "The 'minimum focusing distance' is measured from the image plane (film or sensor) to the subject. This dimension actually increases by the physical length of the converter .... the subject to lens distance remaining the same and hence the camera has 'backed-up' to allow the converter to be slotted in to the setup. In most normal applications the increase (75-100mm) is irrelevant, but it can end up being a significant percentage of the dimension when macro photography is being pursued." Thank you, Bob, for helping me to get that clear! To go back to the beginning of the Accessories section, click below and then choose the accessory that you want to read about.